GRANTED that Madhuri Dixit is no longer in the running as a topper amongst the leading ladies, but that does not make her elegance any less stunning. Madhuri Dixit still happens to be the most beautiful and the most charming Bollywood woman of celluloid, who has merely to smile to have all the men  especially the photographers around  making an instant beeline for this sylph-like former Queen Bee! Im telling you, the undiluted appeal Madhuri exudes hits you with the palpable force of an Agni missile! 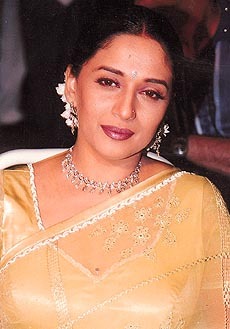 The other day, she had come with Jackie Shroff to release the music cassette of a movie... and believe me, she was looking gorgeous in a pale yellow chiffon saree with just a fine, filigree choker that carressingly complemented her fair, swan-like neck. Whats more, the way she languidly moved from acquaintance to acquaintance  even happily mingling with the Press  there was no doubt in anyones mind as to who the entire evening belonged to! So, okay, Bipasha is a famous model who sashays down the ramp more often than she eats breakfast, granted that shes dusky long-legged and sensuous, but does that give her the right to play games the moment she hits Bollywood? As soon as she was in on Abbas Mustans Talaash, she struck up a close relationship with Adonis Akshay Kumar, in the cool climes of Mauritius. The movie had a long outdoor schedule at the beautiful island nation. Bobby Deol and Kareena were also there, but the attention was entirely on Akki and Bipasha. Its only when the unit hit Mumbai and Shilpa Shetty, that the fireworks began. Ms Shetty lashed out at Bipasha in print and off it. Bips realized the mess she had got into. She went into action fast  offerred a satisfactory(?) explanation to Shilpa that she was "no woman stealer, Akki and she were just good friends (sic) and in any case her man was Milind Soman." If you think thats the end of the game, think again. Last heard, she had dropped Milind and opted for Dino Morea, on whose arm she is making all public appearances. On the side too, shes meeting up with Subhash Ghai, Sanjay Leela Bhansali, David Dhawan and other hot shot film-makers with clinical precision. Bipasha, I think you are well aware that musical chairs ends with just one chair  so get your act together. Nirmal Pandey was brilliant in Darmiyaan, Bandit Queen, Pyaar Kiya To Darna Kya, Godmother and Train to Pakistan. In fact, his menacing screen presences have always been crackling. But off-screen, Nirmals persona has been an absolute put-downer - hes just a dull dehati! So when he went ahead and cut his own album Jazbaa there was shock all around. But the best, or rather worst was yet to come! When the music video of his single was aired, it was just terrible! Pandeys bhaiyya voice was the pits and the visuals  at the very best  painful! Why does every actor think his vocal talent is the chartbuster kind? I think its either professional suicide or a masochistic streak that spurs them on! Or mebbe its just a sadistic delight they want to pile on the viewers/listeners! No guys, I am not talking about Pooja Bhatt, nor am I referring to Pooja Batra (cmon yaar, give me a break!) this is the one and only Pooja Bedi. Pooja the sensual, saucy daughter of two sensational people - Kabir Bedi and (ex) Protima Gauri. Pooja did just a couple of films and a couple of ads and it was like bullseye! Remember the siren of Jo Jeeta Wohi Sikander and the Kamsutra ad which sent the entire nation reeling! The very same Pooja Ebrahim (nee Bedi) has been honing her talent and skill at interior designing and furniture making. With a genuine gift, unstinted focus and a very supportive husband (who already is a thriving furniture dealer and designer), Pooja is now the proud owner of /furniturewalla - the new furniture showroom she has opened in Andheri (a popular suburb of Mumbai). So while Pooja ventures into her creative creations, shes got a man behind her to egg her on and also provide all the financial and commercial help she needs. Sounds like a foolproof formula of a successful bonding!